Today we will discuss about difference between orthogonal and oblique cutting. 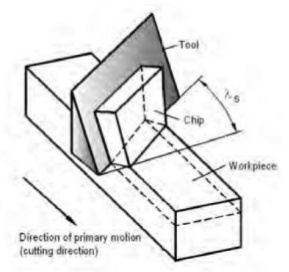 What is Orthogonal Cutting? What is Oblique Cutting? Metal cutting or commonly known as machining, is the most common phenomenon used in manufacturing industries. Every product, big or small, undergoes a machining process to get final product. So the knowledge of basic types of metal cutting are most important. If we talk about metal cutting two terms comes in our mind orthogonal and oblique. These both are the metal cutting mechanism which is purely depending on the feed angle and cutting direction of tool. Orthogonal cutting is a type of metal cutting in which the cutting edge of wedge shape cutting tool is perpendicular to the direction of tool motion. In this cutting the cutting edge is wider than width of cut. This cutting is also known as 2D cutting because the force develop during cutting can be plot on a plane or can be represent by 2D coordinate. 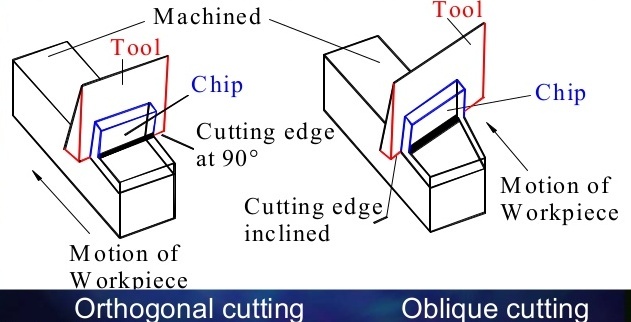 Oblique cutting is another type of cutting in which the cutting edge of wedge shape cutting tool make a angle except right angle to the direction of tool motion. This will affect the cutting conditions. It is also known as 3D cutting because the cutting force develop during cutting cannot be represent by 2D coordinate or used 3D coordinate to represent. 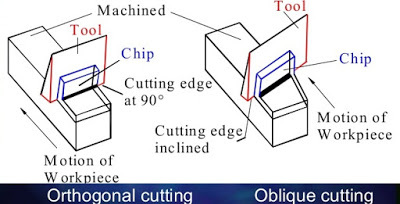 The basic and main difference between orthogonal cutting and oblique cutting is that in orthogonal cutting, cutting edge of the tool is perpendicular to the direction of motion but in oblique cutting the cutting edge make an angle with the direction of motion. There are many other differences which are describe below. 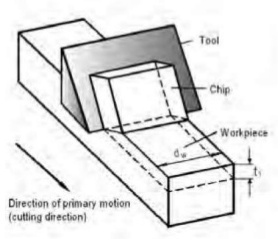 The cutting angle of tool make right angle to the direction of motion. The cutting angle of tool foes not make right angle to the direction of motion. The chip flow in the direction normal to the cutting edge. The chips make an angle with the normal to the cutting edge. In orthogonal cutting only two components of force considered cutting force and thrust force which can be represent by 2D coordinate system. 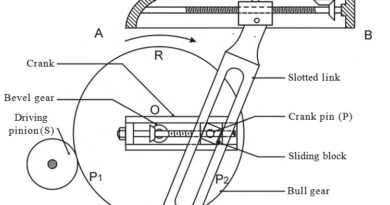 In oblique cutting three component of force are considered, cutting force, thrust force and radial force which cannot represent by 2D coordinate. It used 3D coordinate to represent the forces acting during cutting, so it is known as 3D cutting. This tool has lesser cutting life compare to oblique cutting. This tool has higher cutting life. The shear force act per unit area is high which increase the heat developed per unit area. The shear force per unit area is low, which decreases heat develop per unit area hence increases tool life. The chips flow over the tool. The chips flow along the sideways. Today we have learned about orthogonal cutting and oblique cutting. If you have any query regarding this article, ask by commenting. If you like this article, don’t forget to share it on social networks. Subscribe our website for more informative articles. Thanks for reading it. Very nicely explained. Thank you! Thanks for the explanation.. could you please application of both the cutting operations.. I mean when will you prefer for Oblique cutting against Orthogonal cutting. Oblique Cutting – Milling, Drilling, Grinding, Turning.